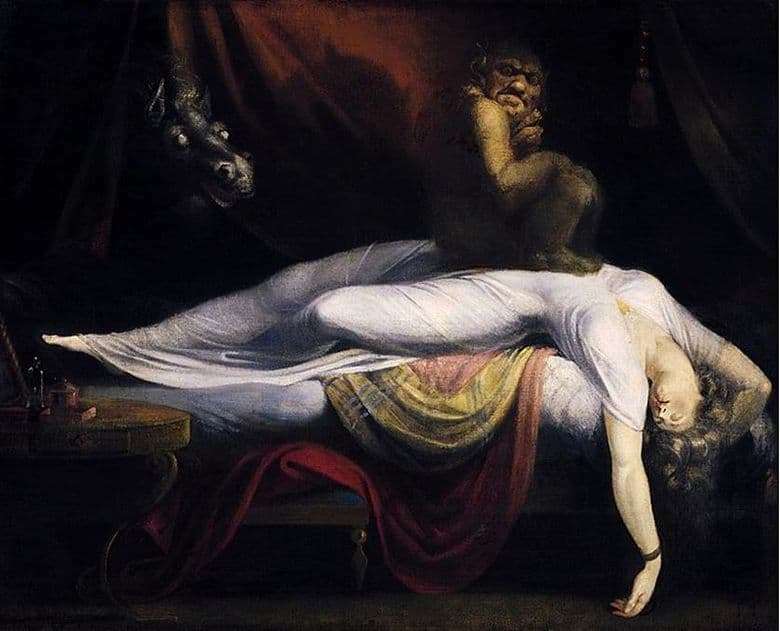 “Nightmare” is a famous painting by the master of horrors, the artist who anticipated the art of his time, Henry Fussley. Gloomy and grotesque, it frightened and caused a storm of reactions from the public. Critics associate it with an outburst of the unconscious, in which sleep and horror intertwine into one. Not for nothing was the canvas in the reception of the famous Dr. Freud, who paid great attention to the interpretation of dreams. The picture captures the girl lying on the bed. It is difficult to say whether she sleeps or is in a deep faint. Her body is elongated and gracefully curved, which once again underlines the weight and absurdity of the demon sitting on the girl’s stomach. From behind the curtains, the head of a black horse with whitish, frightening eyes appears. This image refers to the obsession with demons – the desire for mythological plot, characteristic of the era of late romanism. The snow-white body, the exquisitely painted fabric of the nightgown, tapestries and bedspreads contrasts with the heavy dark background that accentuates the victim’s helplessness, the suffocating wave of rising horror. Art critics continue to argue about whether a demon mastery has sexual overtones. Despite the frankly dark mood of the canvas, it is not devoid of poetry – the light and shadow is described expertly, the transition of shades, the flowing softness of the fabric. The geometry of the work is based on smooth curves and rounded shapes. Feels impeccable sense of style of Venetian painting. Obviously, the artist was also inspired by gothic literature, Germanic legends about evil spirits and the works of the great Michelangelo. The painting is a bizarre mixture of nightmare, sensuality and eroticism. This technique permeates the whole creative path of Füssly. The masterpiece is kept in the open access of the Detroit Institute of Arts.